Six-month-old, well rooted plants tolerate winter temperatures to --29C (-20F). Most individual plants die in their second or third summer, after blooming heavily. Mix a light application of a balanced organic fertiliser into the soil prior to planting. When plants emerge after their first winter, mulch with rich compost or topdress with a balanced organic fertiliser. Mint. Often planted with other tea plants where insects are not wanted. 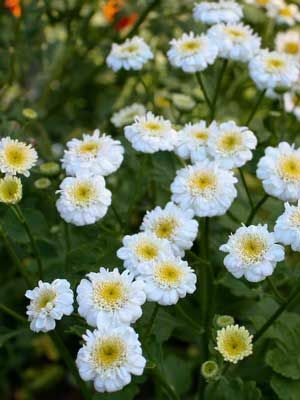 Feverfew repels insects of all nature, so it is a good plant to grow near entryways.